Will the 2019 PA 14 come with a mount for the power pole micro like the 2019 outback does? I ordered the 2019 pro angler, but still don't know if it comes power pole ready!? Ever since they released that option on the outback I can't quit wondering. I don't care about paying for the mount to install it, I just don't like that the only mount available right now only comes in white. So the 2019 pro angler specks get released today right? OK, here’s the scoop. I called Hobie in Oceanside, CA and talked to a kayak guy. The only thing new on the 2019 PA’s... ...There is nothing new on the Outbacks. Pescatarial, I was blown away by the changes to the Outback but the guy I talked to, at Hobie, told me there weren’t any! Maybe he was just having fun because he gets asked that all the time but he really should have told me to just wait until September. Anyway, the new Outback seems to have hit the nail on the head but I’m waiting to see exactly what’s changed on the PA. Can’t wait to compare the two. Bought mine today. Slate, $3549 was the pre-tax. What did you buy in Slate? A 2019 Pa? I'm buying one and want to make a bed mounted holder for my PA14 to sit just above my truck bed (and tool box). Where do the bolsters fit on the PA14 2019? How far from the bow and how far apart? Last edited by TyPope on Wed Nov 07, 2018 2:18 am, edited 1 time in total. I'm buying one and want to make a bed mounted holder for much PA14 to sit just above my truck bed (and tool box). Where do the bolsters fit on the PA14 2019? How far from the bow and how far apart? The manual says: "Space 67" on center". Thanks! That definitely helps. Now, I know they are 67" on center apart from each other. 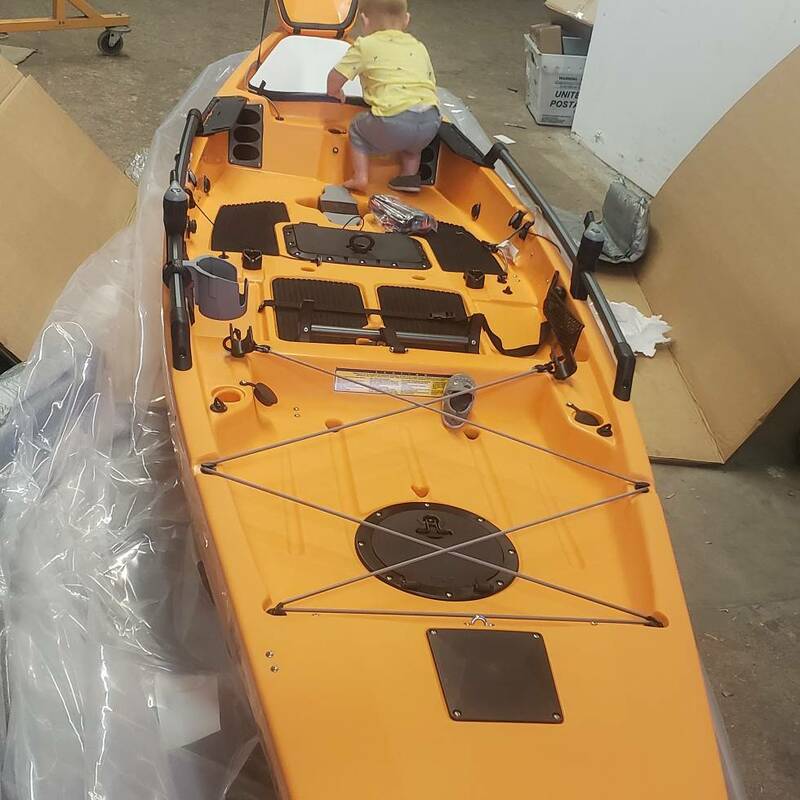 The part I don't know is how far in front of the front cradle does the Kayak extend. In other words, how far from my truck's rear window does the front cradle need to be mounted? Thank you for the cradle instructions you provided. That's quite helpful in itself. Mine is ordered for March delivery! Also, and I head this from a little birdie, there is a Lowrance Hook2 Tripleshot under the tree. I can't wait to get my Kayak and do some fishing. I've spent about 2 hours or so fishing from a Hobie Compass and really liked it. I've never been in a PA before but it'll be more stable, a little wider, maybe a little longer and... Well, I'm just excited. It'll be a frame with the cradle on it that sits slightly above my truck bed so the kayak will clear my toolbox. The frame will have 4 eye bolts at the corners which will connect to my 2 hoists to lift it up out of my truck for storage above in the garage (12' ceiling in there). a baitcast rod holder, Lowrance Hook2 Tripleshot, and a PFD by Linquist (that's also under the tree). I've asked for a few lanyards to keep things secure but that's it. Any recommendations to someone new to kayak ownership (my Dad has many and when I go visit, my girls and I always go out into the gulf to kayak with the rays.)? EDIT: My PA 14 is in and ready to be picked up! I'm going to go over Saturday to get it. I've been waiting to get on the water. Now if the ice and snow would just melt... Yeah, I'm going to go get my PA14 Sled and take it home in the back of my truck over ice and snow covered roads. At least my garage is heated so I can get to outfitting it!